This website (22BATTALION.ORG.NZ) is privately owned, operated and financed by Paul Froggatt, the son of a 22 Battalion veteran. Some of the information presented here has been obtained from my own personal records and photographs. More has been provided by the families of other 22 Battalion men and I am grateful to them for allowing this information to be shared more widely. The bulk of the information and records have been copied from official sources held at the National Archives, National Library and the Alexander Turnbull Library. I am grateful to the Librarians and staff who have assisted with sourcing the records and allowing me to copy them. Permission to reproduce these records was obtained from the relevent insitutions and file references are recorded where appropriate. The website is provided as a repository for information about the 22 Battalion and the men who served in it. They made it the longest serving and one of the best-performing infantry battalions of the Second World War. Apart from the Official History publication, very little information is available publically about the men, their experiences and their photographs. This website is not associated with the Twenty Second Battalion Association (which was disbanded in 1991) or regional associations, but it draws on the material and records of these associations. Unless otherwise indicated, all material on this website is subject to copyright protection to the owner of the website in the first instance unless stated otherwise. Copyright in personal photographs remains with the owner of the photograph, who has given their permission for the images to be displayed on this website. New Zealand and international copyright laws protect third party material on this site. Authorisation to reproduce such material should be obtained from the copyright holders concerned, who can be contacted through the website owner in the first instance. The text and images on this site are intended for the personal use of students, scholars and the public and may be downloaded solely for this purpose. Schools and students may reproduce materials on this website, either in part or in full, for bona fide study purposes, with suitable acknowledgment. Any other use or publication of them, without prior permission of the copyright holder, is strictly prohibited. For written permission to reproduce information, images or other resources on this website, please contact the website owner in the first instance. Email: paul@frogs.co.nz. Copyright in your contribution (including images) submitted to the site by you or a third party on your behalf will remain with you. This permission is not exclusive, so you can continue to use the material in any way including allowing others to use it. 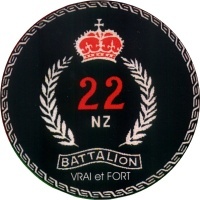 The 22battalion.org.nz website does not use browser cookies, nor does it use Google Analytics or other tracking monitoring. We do respect your privacy. Any information provided by email or other contact with the website owner will not be passed on to a third party without your knowledge and consent. Links to this site are welcomed. However we would appreciate it if you would advise us of such links, so that we can inform you if locations change or if references are incorrect.